Shopping for Power Rangers Vehicles: Die-Cast Metal? The Power Rangers Zords from the Nickelodeon TV show Power Rangers Megaforce have been given the Hot Wheels treatment in this Hot Wheels Power Rangers Megaforce Wave 1 Vehicle Case! 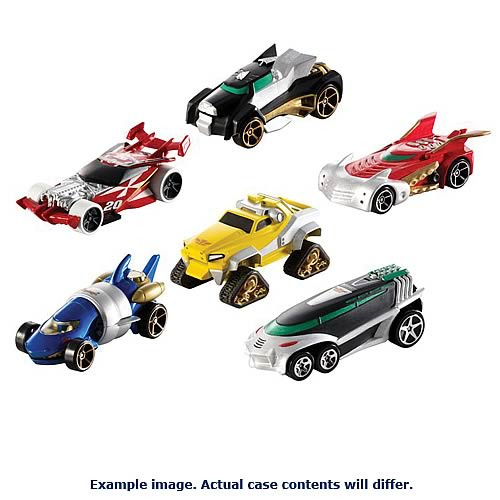 These 1:64 scale die-cast vehicles are designed specific to the Power Rangers Zords from the 20th anniversary Power Rangers Megaforce season. Not for use with some Hot Wheels sets. Ages 3 and up.